The Intercontinental Alpensia Pyeongchang Resort has opened in South Korea. 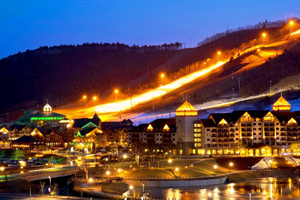 The 238-room mountainside resort is located in the Alpensia village in the Taebaek Mountains. The luxury resort offers several restaurants including Flavours, an Italian/Korean-inspired all-day dining restaurant with an open show kitchen. There is also a spa and an open-air concert hall. Event space includes a conference centre for up to 1,600 delegates, two ballrooms and an auditorium. Nearby incentive activity options include a ski park, a 27-hole golf course designed by Robert Trent Jones Jr and the Ocean 700 water park. C&I, C&IT, meetings, incentives, conferences, events, event planner, event agency, event ideas, venues, accommodation, MICE, M&I,, The Intercontinental Alpensia Pyeongchang Resort ,South Korea.